It's official - my blocking pile is getting out of hand. I now have 4 lovely things that need blocking. They really are lovely too, so it's frustrating that they are a crumpled mess that can't be used until I'm properly healed. It's frustrating from a blogging point of view too, because I don't want to show photos of said crumpled messes. I want to show photos of the finished product, when it's looking at it's prettiest. My latest finished project is a Christmas gift (it may be the first and only time I'm not rushing a huge project at the last minute) so I can't show any gorgeous finished photos anyway, so I'll just show a teaser photo of when I was casting off. I wish I could show you more of this item, because it is gorgeous. Ah well, at least I'll have something to blog about in the post-Christmas lull. In other news, I received the yarn that was dyed for the winner of my Blogging Anniversary Contest. The yarn is gorgeous, and I very nearly kept it for myself. 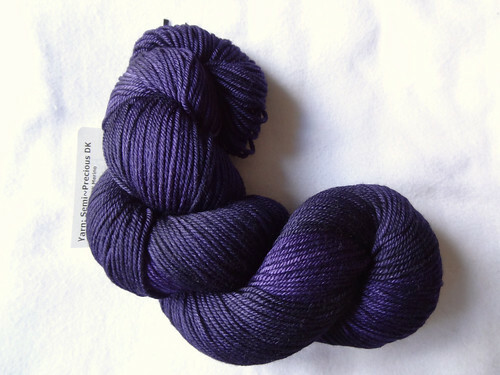 The yarn chosen by the winner, Monica is BabyLongLegs Semi-Precious DK in the colourway Purple Tempest. It is sooooo yummy. It's soft and supple with an amazing drape and richness of colour. Whatever Monica, makes with this yarn will be something very special indeed. It broke my heart to pack it up with the rest of her prize and post it out to her. 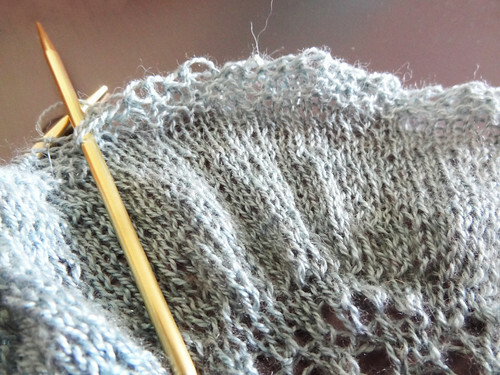 I really do recommend checking out BabyLongLegs yarn, by clicking on the button, as it is incredibly sumptuous and decadent, and we all need little luxury in our lives, don't we!